Italian American, Emanuele “Litto” Damonte (1892-1985) was a marble worker and stonemason by training who first traveled to America in 1914 under a contract to work on the Stanford University Chapel in Palo Alto. With his father and brother-in-law, Litto was responsible for carving the altar, along with the Stations of the Cross. After finishing the project, they returned to Italy, later returning a second time under a new contract to work as a marble cutter for the “big man” as Litto described him. The “big man” in this case was none other than newspaper mogul, William Randolph Hearst, and their job was to work on the now famous swimming pool at Hearst Castle near San Simeon, California. With his work at San Simeon completed, Damonte moved with his wife to South San Francisco where he and his brother-in-law founded Golden West Concrete, a small cement business. Their company was awarded a major contract for the construction of sidewalks in San Francisco’s Sunset District, where a new development was transforming the area’s former sand dunes into neighborhoods on the city’s western edge. The successful business venture allowed Damonte to save enough money to buy a large ranch near the small country town of Pope Valley in Napa County, an hour’s drive north of San Francisco. It would be a few years before Litto permanently settled at his Pope Valley ranch where he planned to retire. When Damonte finally moved there in 1930, access to the long narrow valley was provided by a rough dirt road that wound along his property. It wasn’t until 1960 that the county finally surfaced the road. But, for those driving on the earlier pothole filled, irregular and bumpy dirt road, it was not unusual to lose a hubcap or two. Damonte began retrieving the errant hubcaps and placed them on his fence as a courtesy to drivers he thought would return to collect them. Before too long, what had begun as a gesture to repatriate the missing hubcaps, became a collection. Much like the mighty oak tree’s humble beginnings, the hubcap collection began to grow through his ongoing collecting and as passersby dropped off hubcaps as word spread of his unusual fence line display. Damonte, who liked anything shiny, began placing these new additions along with other shiny objects in an attempt to refine his ever-growing assemblage. The long barbed wire fence running the property length in two directions was soon covered with hubcaps, TV dinner trays, bottles, pull tops, flattened daisy cut can bottoms and old tires. That Hubcap Ranch still exists 27 years after Litto’s death is due to his grandson Mike Damonte – the local Fire Chief and a school board member – who has maintained and continued to add to the unique folk art site as a tribute to his grandfather in continuance of the now well-established family tradition. 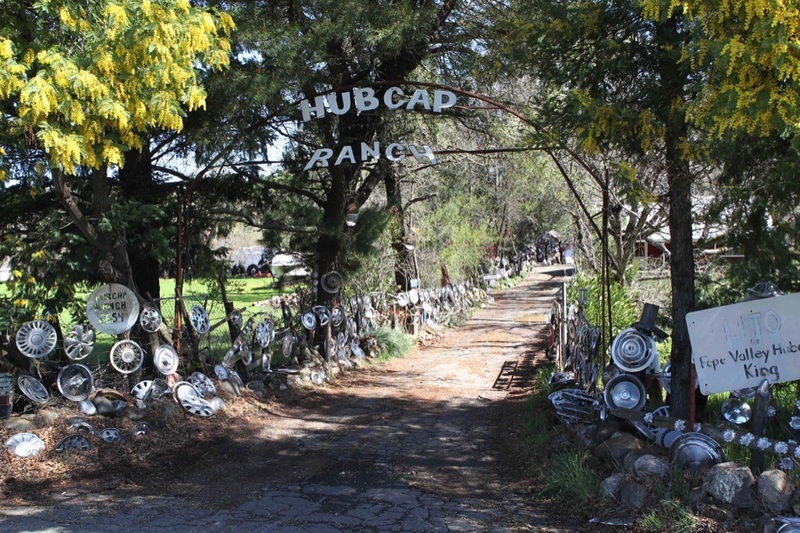 After Litto’s death, Mike was able to purchase the property from the other heirs and began to undertake the restoration and ongoing growth of the ranch that is now home to more than 5,000 hubcaps along with an assortment of various other objects. In 1987 the California State Department of Parks and Recreation along with SPACES (Saving and Preserving Arts and Cultural Environments) – the group founded by Seymour Rosen in 1978 – donated a California Historical Landmark bronze plaque denoting Hubcap Ranch as an “exceptional” 20th century folk art environment. Mike has installed the plaque in a large stone memorial that he constructed along the roadside just north of the ranch’s entrance. To complete the setting thematically, he added a small collection of hubcaps along its base and framed the memorial with a hubcap arch completing it with an American flag mounted atop a tall pole. Today, hubcaps are less plentiful than they once were, as automobile manufacturers prefer higher profit rims in new car designs. But, as Mike Damonte tells it, they still do appear magically at the ranch’s entrance during warm weather when traffic along the road is at its heaviest, providing him with an ongoing supply that he readily adds to the ranch’s growing collection. When asked how many hubcaps there are, he confessed that he didn’t exactly know for sure, but suggested that he might bring in students from the local elementary school to count them as a classroom project. Fortunately, Hubcap Ranch has not fallen into disrepair or disappeared as has happened to so many other folk art sites such as Retired Lawn, (see Grassroots Art Center News, Spring 2009) and Grandma Prisbrey’s Bottle Village, No Deposit No Return (see Grassroots Art Center News, Fall 2007). Too often the story is that when a folk artist dies, the person’s life’s work either declines for lack of upkeep or disinterest or more likely is dismantled with the property being sold by heirs, thus erasing a personal space that has in most cases taken decades to create. This common fate is even more reason to visit and document these valuable cultural sites while they still remain. But hope reigns supreme with Mike Damonte’s son, Litto, named after his great-grandfather, who will no doubt fall heir to the family tradition guarantying that Hubcap Ranch will be around for some time to come. The collection and assemblage didn’t just end at the fence, however, as it continued through the entry driveway beneath the ranch’s sign and back into the property ending in an open area between the house and several adjacent outbuildings. Along the driveway, Damonte created several small cement sculptural tableaus where he permanently embedded in cement commercial garden sculptures, Madonnas and many of his grandchildren’s toys. Mixed into his composition are road signs, license plates, old tires, and an airplane prop, sent home from Europe during WWII by his son, Howard, who was killed in action. It was with the death of Howard that he first began his work on Hubcap Ranch. For some folk artists, traumatic events and experiences such as this have often been the catalyst that launched them into their life’s artistic endeavors. (Examples of which can be found in two articles previously discussed in the Grassroots Art Center News, Capidro, A Garden of Concrete Ideas [Fall 2008] and Wickham Stone Park, Palmyra, Tennessee [Spring 2011].) At one time Damonte even nailed flattened hubcaps onto the asphalt driveway surface leading into the property. But it is at the end of the driveway, in an open courtyard between his house and some small outbuildings, that Damonte chose to display his most prized and rare hubcaps and license plates by nailing them to two small buildings, the side of his house and a large adjacent tree. The overall effect of the ranch is one of striking visual beauty exhibiting great care with attention as to placement of the selected objects in a very personal space. It is interesting to note that Damonte, unlike many folk artists whose work is created to convey a message, never titled or named his compositions or individual tableaus as he evidently believed that the name of the ranch said it all and that any further elaboration was unnecessary. Damonte worked on Hubcap Ranch for more than 30 years, until his death in 1985, by then amassing over 2,000 hubcaps and an undetermined number of other elements included in his environmental work.